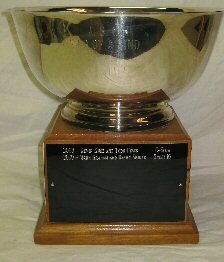 This trophy is awarded to the winner of the Two-of-a-Kind Regatta which is held during the year. This regatta matches two members of a class , sailing their own boats, in a series of races scored on a handicap basis. The trophy is a silver bowl donated by the Bank of Jacomo.